Well, actually, things are changing. In the time I’ve lived here, we’ve seen the revamp of St Pancras station into probably one of the most glorious rail termini in the world, which has brought with it a clutch of rather chic places for a drink and a bite to eat. It’s also going to be from here that people will board those nifty “javelin” trains that will whisk them out to the shiny new Olympic park. So, in short: it is indeed up and coming. Clearly there are all manner of grand projects, but there are also a nice range of bars, cafes, brassieres and the like springing up. And that’s how I found myself in The Fellow on York Way. …but the good news is that what they do offer is innovative, beautifully presented and very, very tasty. I also has the sheer joy of some of the best service I may ever have had in London. A waitress who was friendly, attentive but not hovering, and who could actually express an opinion about the menu. She knew her stuff, which I love. My friend Sunshine taught me to ask questions, and I think it’s always a good sign if the people who are working there know their dishes. It’s also got a rather nice vibe too – good decor, trendy but not too fancy, and feels very relaxed. It isn’t trying too hard, and is all the more pleasant for it. You could come here with friends for a relaxed dinner, or equally come here for a slightly more intimate dinner à deux. So what did I have? Well, as I said, it was limited choice. 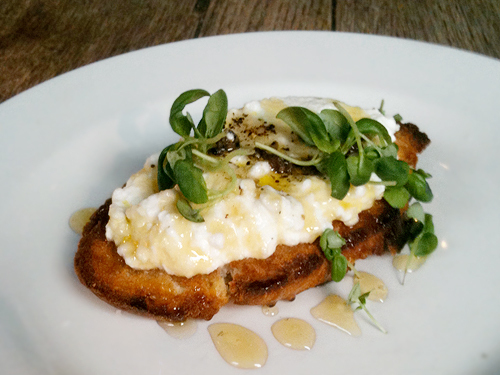 I started with the unappetisingly-named “cow curd” on toast with truffle honey. What it turned out to be was something akin to the most pillowy-soft mozzarella you could imagine. Not stringy, not rubbery, just perfect. It just held together and then collapsed when you ate it. Worked beautifully with the honey (just a fleeting hint of truffle, no more) and some baby basil leaves. The fact is was a small starter was also really quite a nice touch. Starters don’t need to be the size of mains, in my view. Clean, simple, fresh and tasty. Big tick! Now, the main. It could so easily have been the dreaded mushroom risotto. And I am sure that if the chef in The Fellow made a mushroom risotto, it would be delicious. But not tonight. Instead, there was a barely pilaf with pecorino cheese and wafer-thin strips of fresh yellow squash, and a splash of good olive oil and fresh black pepper. I can honestly say it was one of the tastiest things that I’ve had for a while. It was a great contrast of textures too. As we had not filled up on bread or other nibbles before the meal, when the waitress wandered over and asked if we wanted to look at the dessert menu, not much persuasion was needed. Nice, seasonal desserts (a greengage fool or a selection of British cheeses being some of the highlights), but there was one thing that really stood out for me – deep-fried choux buns, served with a dusting of cinnamon sugar and blueberry compote. Sublime. I wish I had a picture, but it was just a great big fried-sugary-jammy mess which tasted super. Like a luxury take on churros. Would I go back? Definitely. And that is saying a lot for a place that usually only has one veggie option. So it’s great that it’s not much more than a hop, skip and a jump from where I work. And if you happen to find yourself seeing someone off on the train to Paris, you might be tempted to skip some of the chains and try somewhere a little different too. The Fellow, 24 York Way, London N1 9AA, Tel: 0207 833 4395. Tube: King’s Cross St Pancras.